Obesity is on the rise across America, and earning a lot of money doesn't necessarily protect against it. Previously, obesity was associated more with poverty than wealth, say University of Iowa researchers including Nidhi Maheshwari, MBBS, a graduate research assistant in epidemiology. But during the past 30 years, obesity has grown at all income levels — especially among the richest Americans, say the researchers, who reported their findings in Washington at the American Heart Association's 45th Annual Conference on Cardiovascular Disease Epidemiology and Prevention. "There has been a perception that poor people are more likely to be fat," says Maheshwari, in a news release. "However, obesity is growing at a much faster rate in those with the highest incomes." Obesity is still most common among those with the lowest incomes — but not by much. People earning the most money ($60,000 per year or more) had the biggest growth in obesity from the early 1970s to the turn of the century, say Maheshwari and colleagues. "The fact is that obesity is increasing in all races, all income categories, and at a faster rate with people in higher incomes," says the University of Iowa's Jennifer Robinson, MD, MPH, in a news release. "Obesity prevalence is now similar across all income categories, with obesity prevalence in the highest income group rapidly approaching that of the lowest income group," says Robinson, an associate professor of epidemiology who also worked on the study. Numbers are based on national surveys of adults who were at least 20 years old. Obesity was defined as body mass index (BMI) of 30 or higher. Income was adjusted to year 2000 U.S. dollars. The statistics don't include people who are overweight but not obese (BMI of 25-29.9). Rich or poor, obesity is widely considered a health risk. It's been shown to burden just about every part of the body. 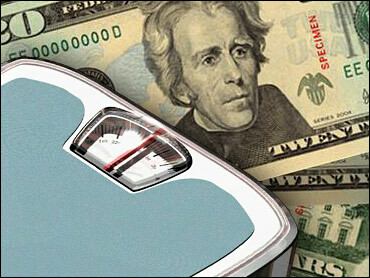 The federal government has set a goal of reducing obesity to less than 15 percent of the adult population by 2010. The latest data from the National Center for Health Statistics show that 30 percent of U.S. adults are obese and 16 percent of children and teens are considered overweight, which increases their risk for obesity. For many of us, changing what we eat, reducing calories, and becoming more active are ways to help reduce weight or maintain weight loss. See a doctor for guidance to get started. Sources: American Heart Association's 45th Annual Conference on Cardiovascular Disease Epidemiology and Prevention, Washington, April 29-May 2, 2005. News release, American Heart Association. CDC.